He was the embodiment of pure intellect, the bumbling professor with the German accent, a comic cliche in a thousand films. Instantly recognizable, like Charlie Chaplin's Little Tramp, Albert Einstein's shaggy-haired visage was as familiar to ordinary people as to the matrons who fluttered about him in salons from Berlin to Hollywood. Yet he was unfathomably profound  the genius among geniuses who discovered, merely by thinking about it, that the universe was not as it seemed. Much to his surprise, his ideas, like Darwin's, reverberated beyond science, influencing modern culture from painting to poetry. At first even many scientists didn't really grasp relativity, prompting Arthur Eddington's celebrated wisecrack (asked if it was true that only three people understood relativity, the witty British astrophysicist paused, then said, "I am trying to think who the third person is"). To the world at large, relativity seemed to pull the rug out from under perceived reality. And for many advanced thinkers of the 1920s, from Dadaists to Cubists to Freudians, that was a fitting credo, reflecting what science historian David Cassidy calls "the incomprehensiveness of the contemporary scene--the fall of monarchies, the upheaval of the social order, indeed, all the turbulence of the 20th century." 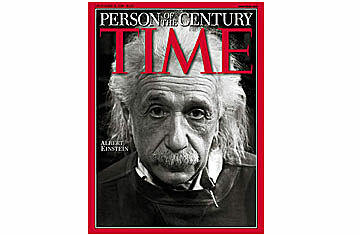 Einstein's galvanizing effect on the popular imagination continued throughout his life, and after it. Fearful his grave would become a magnet for curiosity seekers, Einstein's executors secretly scattered his ashes. But they were defeated at least in part by a pathologist who carried off his brain in hopes of learning the secrets of his genius. Only recently Canadian researchers, probing those pickled remains, found that he had an unusually large inferior parietal lobe  a center of mathematical thought and spatial imagery  and shorter connections between the frontal and temporal lobes. More definitive insights, though, are emerging from old Einstein letters and papers. These are finally coming to light after years of resistance by executors eager to shield the great relativist's image. Unlike the avuncular caricature of his later years who left his hair unshorn, helped little girls with their math homework and was a soft touch for almost any worthy cause, Einstein is emerging from these documents as a man whose unsettled private life contrasts sharply with his serene contemplation of the universe. He could be alternately warmhearted and cold; a doting father, yet aloof; an understanding, if difficult, mate, but also an egregious flirt. "Deeply and passionately [concerned] with the fate of every stranger," wrote his friend and biographer Philipp Frank, he "immediately withdrew into his shell" when relations became intimate. See the Person of the Century issue.